Düsseldorf seemed quiet on this Sunday morning. Stores were closed for the day, and just a few souls occupied the churches along my way — Andreaskirche (Church of St. Andreas), with its astounding stucco ceiling that has to be seen to be believed, and Lambertuskirche (St. Lambert’s Basilica), one of the oldest buildings in the historic core of the city (completed in 1394), with its outdoor life-size Crucifixion scene and its twisted spire (thanks to, according to urban legend, an experienced bride who showed up on her wedding day in a white dress, claiming to be a virgin; the tower turned to its side in shame). 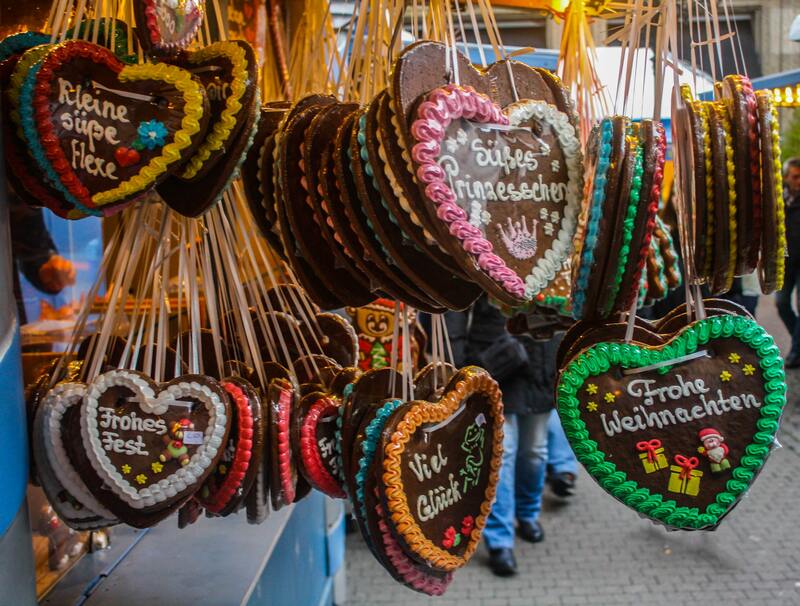 The heart-shaped Lebkuchen is a favorite German treat. But that all changed when I reached the bustling Christmas Market on Marktplatz beside the Altes Rathaus (Old City Hall), completed in 1573. The city’s population was out in full force here. A tree decorated solely in red — balls, pendants, ribbons — complemented the red roofs of the stalls that surrounded the equestrian statue of Johann Wilhelm II, duke and Elector Palatinate around the turn of the 18th century. I sipped on a hot chocolate as I admired the hand-carved life-size manger scene and threaded my way through the crowds. The quieter Christmas Market on Flinger Straße took a delightful turn thanks to its unique stalls. The facades were modeled in the style of the city’s old townhouses. Instead of holiday lights or ornaments, vendors opted to embellish their stalls with fishscale roofs, a flat front of mansard windows dripping in snow, and painted windows and bricks along their sides, making them unlike any others I had seen. I couldn’t resist purchasing from these booths a goody that I had been spying everywhere — a heart-shaped Lebkuchen, a somewhat spicy baked treat very similar to gingerbread and iced with brief messages, well wishes, and sentiments in German. I followed this row of distinctive stalls down to Heinrich-Heini-Platz to a third market, the Engelchenmarkt (Little Angels’ Market). Framed by the Art Nouveau Wilhelm Marx House (1924) and the six-story Carsch-Haus department store, the platz features a small music pavilion that gets co-opted in December by the market for those who choose to sip their glühwein and beer under a bit of shelter. Floral motifs, white lights, and angels in various poses — contemplative, playing an instrument, holding a candle — adorn all the stalls here, giving it a cohesive uniformity unlike the other markets. The Konigsalle is an irresistibly romantic place to take a break from the bustle of the markets. 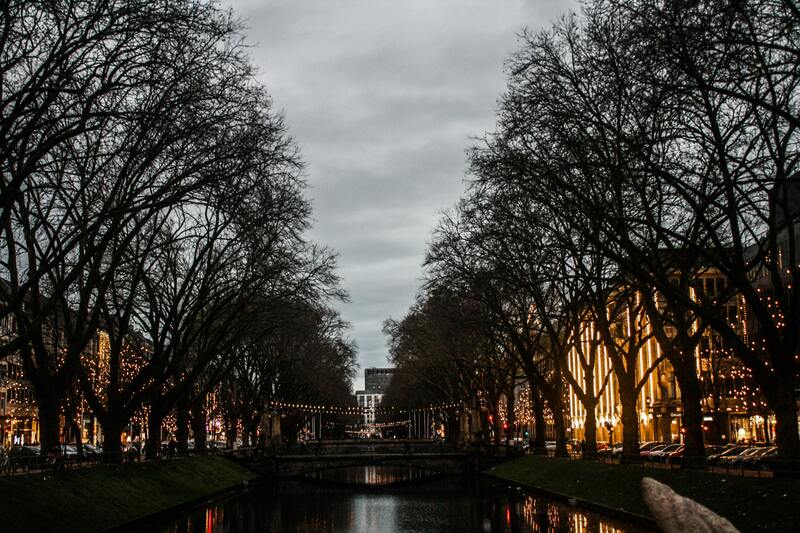 Just a block away, Düsseldorf’s famous shopping boulevard provides an utterly charming breathing space for the city. Running for about half a mile, the Königsallee ordinarily bustles with the beau monde patronizing the high-end fashion and luxury-item shops that line both sides of the street. But, today, with all the stores closed, it was subdued. Two hundred years old, the Königsallee features a central canal that stretches just over 100 feet across, crossed by a handful of bridges illuminated by lanterns dangling from eagle-head brackets on tall stone monuments. A fountain with the Greek god Triton battling a giant fish that spits water into the canal anchors the northern end. I took a seat on one of the benches under the single rows of chestnut tree to enjoy a nicely salted Bavarian pretzel and the peaceful views of the landscaped banks that slope down to the water on both sides. Fairy lights draped from one end of each bridge to the other and poured down from some of the trees and buildings decked out with white stars. I couldn’t think of a more pleasant way to terminate the day and to start thinking about tomorrow’s sojourn to the city I was anticipating most — Heidelberg.